1- Add 3 clips and split them (shift + r) every ten frames for example. 2- Move and resize the cut parts around. Moving various clips doesn't work. Box selecting (shift + left click + drag) various clips in the timeline and trying to move them doesn't work. WARNING: Unknown type : "fixed"
Thanks Farid for this feedback. I think these 3 issues are now fixed in git, and I will prepare a new AppImage tomorrow. Cool JB, once you release the new version I will try to do more tests. Moving various clips in the timeline is laggy compared to when moving a single one. I noticed this happens when the clips are short in length. Another fade handle being drawn incorrectly. The handle shouldn't pass the clips length. An error happens when trying to add a fade from black for example after changing a clips length in the timeline. 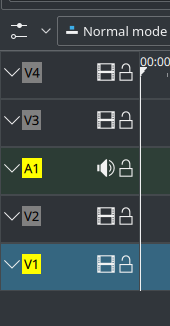 This kind of issues when changing a clips length after adding it to the timeline have happened in current version of Kdenlive with some effects if I am not mistaken. Would be cool to go deeper into this issue. See video. Crash when right-clicking on a clip in the timeline and choosing "Extract" from the menu. Snapping isn't working or it is very weak. Ctrl + Shift + left drag select should add the highlighted clips to an existing selection. It isn't working atm. Clip thumbnails in thimeline should scale better when resized. See videos. The fade issues and crash on Extract should now be fixed in the latest AppImage that is uploading right now. Should be completely uploaded 1 hour (very slow connection at home - size file is 173Mb). Trying to construct 7 tracks. /////////// creatclipsfromlist (QUrl("file:///home/farid/Gunga/Festival de Cinema de Taguatinga/video/logo.png"), QUrl("file:///home/farid/Gunga/Festival de Cinema de Taguatinga/video/tratado-audacity.wav"), QUrl("file:///home/farid/Gunga/Festival de Cinema de Taguatinga/video/12FestivalTaguatingaCinema.mp4")) true "-1"
/////////// createClipFromFile "/home/farid/Gunga/Festival de Cinema de Taguatinga/video/logo.png" "-1" QUrl("/home/farid/Gunga/Festival de Cinema de Taguatinga/video/logo.png") "image/png"
/////////// final xml "<producer length=\"120\" type=\"5\" in=\"0\">\n <property name=\"resource\">/home/farid/Gunga/Festival de Cinema de Taguatinga/video/logo.png</property>\n</producer>\n"
MANAGE BIN ITEM INSERT "2"
/////////// createClipFromFile "/home/farid/Gunga/Festival de Cinema de Taguatinga/video/tratado-audacity.wav" "-1" QUrl("/home/farid/Gunga/Festival de Cinema de Taguatinga/video/tratado-audacity.wav") "audio/x-wav"
/////////// final xml "<producer>\n <property name=\"resource\">/home/farid/Gunga/Festival de Cinema de Taguatinga/video/tratado-audacity.wav</property>\n</producer>\n"
MANAGE BIN ITEM INSERT "3"
/////////// createClipFromFile "/home/farid/Gunga/Festival de Cinema de Taguatinga/video/12FestivalTaguatingaCinema.mp4" "-1" QUrl("/home/farid/Gunga/Festival de Cinema de Taguatinga/video/12FestivalTaguatingaCinema.mp4") "video/mp4"
/////////// final xml "<producer>\n <property name=\"resource\">/home/farid/Gunga/Festival de Cinema de Taguatinga/video/12FestivalTaguatingaCinema.mp4</property>\n</producer>\n"
MANAGE BIN ITEM INSERT "4"
&&&&&&&&&&&&&&&&&& THUMB JOB STARTING:  "3"
&&&&&&&&&&&&&&&&&& THUMB JOB RESULTS COMMITTED:  "3"
&&&&&&&&&&&&&&&&&& THUMB JOB STARTING:  "2"
&&&&&&&&&&&&&&&&&& THUMB JOB STARTING:  "4"
&&&&&&&&&&&&&&&&&& THUMB JOB DONE:  "2"
&&&&&&&&&&&&&&&&&& THUMB JOB RESULTS COMMITTED:  "2"
&&&&&&&&&&&&&&&&&& THUMB JOB DONE:  "4"
&&&&&&&&&&&&&&&&&& THUMB JOB RESULTS COMMITTED:  "4"
/// INVALIDATE CLIP ON INSERTT!!!!!! Split audio isn't working if there is a track below the top one. 1- Add two tracks to the timeline, one on top of the other. 2- Select top clip add split audio. The audio disappears instead of going to a track below or give a warning. If you split the audio of a clip, you shouldn't be able to resize the audio or video clips unless you ungroup them. Zoom should be at the location of the mouse pointer and not at the position of timeline cursor. Trying to move a clip while another one is blocking its path creates a possible corruption. See video on possible way to trigger it. The crash on "extract" is caused by a regression in Qt (I used Qt 5.9.2 instead of 5.9.1 in latest AppImage). Now testing if it is fixed in Qt 5.9.4. The timeline corruption should be fixed in git. I will work on other reported issues and release a new AppImage by the end of the week. Fantastic JB, I'll give it a test on Saturday/Sunday. This corruption scared me honestly as the refactoring should be in theory corruption proof. Hopefully we'll catch them all before release! 3- Rubber select a part and try to move it. Sometimes it crashes and others the clips get drawn on timeline crazily. Scrolling mouse on timeline creates weird behavior. Notice the timeline cursor position as well. Cut still not working. It seems it groups clips when you cut them. Timeline corruption example after group cut. Clips moves backwards when released if mouse cursor moves beyond the - axis of the clips translation. See video and notice how the clip jumps if the mouse cursor moves beyond the y-axis. Thanks for the reports. I think I have now fixed all these issues in git, thanks for the report. I will issue a new AppImage this week-end. Also, to clarify the timeline refactoring doesn't mean the timeline canno be corrupted, but it means that bugs can be isolated and fixed in a proper way, which was previously impossible. 2- Zoom should be at the location of the mouse pointer and not at the position of timeline cursor. Clicking beyond the 00:00:50:02 timezone doesn't move the timeline cursor to the desired spot. Edit: Actually this varies. You cant move freely though, there seems to be a limitation. Maybe make clips rescale when dragging them to tracks with different dimensions. Or think of a better solution. Still corruption issues with ungrouping clips. One shouldn't be able to cut clips in locked tracks. IMPORTANT: Crash on muting/unmuting tracks. file:///tmp/.mount_IAewvw/usr/lib/qt5/qml/QtQuick/Controls/Private/BasicTableView.qml:615:17: QML Item: Binding loop detected for property "width"
trying to load "/tmp/.mount_IAewvw/usr/lib/qt5/plugins/kf5/kio/file.so" from "/tmp/.mount_IAewvw/usr/lib/qt5/plugins/kf5/kio/file.so"
kf5.kservice.sycoca: Invalid Service :  "/usr/share/applications/org.gnome.ChromeGnomeShell.desktop"
/////////// creatclipsfromlist (QUrl("file:///home/farid/Gunga/Juvelinas/Render/Aniceto-insta.mp4")) true "-1"
/////////// createClipFromFile "/home/farid/Gunga/Juvelinas/Render/Aniceto-insta.mp4" "-1" QUrl("/home/farid/Gunga/Juvelinas/Render/Aniceto-insta.mp4") "video/mp4"
/////////// final xml "<producer>\n <property name=\"resource\">/home/farid/Gunga/Juvelinas/Render/Aniceto-insta.mp4</property>\n</producer>\n"
This happens only with some effects among the ones I remember are Transform and Auto Mask. /////////// creatclipsfromlist (QUrl("file:///home/farid/Gunga/Juvelinas/Render/FlautinsMatua_HD_dust.mp4"), QUrl("file:///home/farid/Gunga/Juvelinas/Render/Alvenaria.mp4")) true "-1"
/////////// createClipFromFile "/home/farid/Gunga/Juvelinas/Render/FlautinsMatua_HD_dust.mp4" "-1" QUrl("/home/farid/Gunga/Juvelinas/Render/FlautinsMatua_HD_dust.mp4") "video/mp4"
/////////// final xml "<producer>\n <property name=\"resource\">/home/farid/Gunga/Juvelinas/Render/FlautinsMatua_HD_dust.mp4</property>\n</producer>\n"
/////////// createClipFromFile "/home/farid/Gunga/Juvelinas/Render/Alvenaria.mp4" "-1" QUrl("/home/farid/Gunga/Juvelinas/Render/Alvenaria.mp4") "video/mp4"
/////////// final xml "<producer>\n <property name=\"resource\">/home/farid/Gunga/Juvelinas/Render/Alvenaria.mp4</property>\n</producer>\n"
// NON GROUPED SELCTUIIN:  (8)  !!!!!! // NON GROUPED SELCTUIIN:  (10)  !!!!!! parsing keyframe "0 0 1920 1080 1"
Project Monitor controls don't work correctly. Tracks are stuck in vertical size. You can just open and close but not resize. Icons are shown partially. Speed change on a simple AUDIO clip or on a split audio track from a video clip doesn't' work. When you in STRICT MODE insert an audio clip on an audio target only, you find 2 objects in the timeline: an empty video track (inside the target track) and the audio clip in the track below. See you tonight at the Kdenlive Café. This comment was removed by massimostella. After you worked on the timeline, the cursor In the CLIP MONITOR doesn't move when you click on the bar or if you use GO to IN or GO to OUT. You can see a blue line but the cursor stays in position and you can't perform any action but play. In and OUT points are not set automatically on the first and the last frame when you open for the first time a clip in the monitor. Drag and drop from the clip monitor to the timeline it's not possible until you don't set any IN OUT point manually. Catching them bugs like crazy! When you insert a simple audio clip on an audio target only, the video already on timeline moves forward also when a video track is locked. When in an empty timeline you insert one video clip at the first frame or where the edit line is, the Project monitor doesn't update automatically but stay black. To conclude, I suggest changing the position of the labels for the IN and OUT point in the monitor. At the IN point, we could show the label on the left side and at the OUT point on the right. This helps to understand faster without reading the text inside the label where you are. A different colour could help too. Sporadic crashes and/or corruptions using V and B insert modes. thank you for devloping this GREAT! @alcinos. Just for my curiosity: How do you find all the positions in the code (CPP files) which must be changed? And this so quick! Kudos. two click on clip in timeline 2.0 open dialog for time duration and click ok, result mouse is connected for MOVE any move the mouse.. this is serious..
Monitor refresh bug fixed, thanks for the report! you can compile last git in appimage? so i will can check and report somethings..? thank you fix it also @alcinos..
hi i find problem serious for seletion in timeline2.0..timeline goes in crazy move continue infinity..
later i will check for new report, thank you. this is clear for ordering..
but there is other BUG for tracks..
but this is BUG for REFRESH is MISSING.. so i try move the scroll-bar vertical find to right few move is refresh in timeline all correct.. so this is bug..
i hope this report is help to team developers..
i find BUG level medium-high: not work in timeline 2.0 move other track number V4 and V5 ..other STRANGE: clip video get in track of AUDIO?? ?..this is correct..? all clip of VIDEO must to be place in all track of VIDEO and not to track of AUDIO..right? please check in code..clips video must to SNAP all track of VIDEO ONLY and not AUDIO.. for avoid in crash or is not professional editing video.. i think..
i'm sorry if i'm do disturb here new reports..
ok so i can continue report long time..? it's joke! i try..
i find Serious bug: interlaced and de-interlaced import clips NOT STABLE..bad works..BAD FEEDBACK or BAD REFRESH..change profile of project..all are bad = NOT STABLE..damn it..
i dont understand where is problem FROM...uhm..
see screenrecord all truth what is happen..
you can download file original size 62.3MB RAW FOOTAGE..
timeline 2.0 is missing PAN for move the area of timeline..Refactoring is missing instead STABLE is there PAN..(use press CTRL+Mouse-button-right)..maybe this is missing..? i add area empty for EASY for SELECTION RECTANGLE for me.. but that area empty not work in scroll mouse for move timeline.., but works only in area of tracks..
why i use area empty? because that is easy if i need to selection from bottom to up selection level of video clips..this is my case..
for my this is need if people will use from bottom to up for selection clips level..okay? A- multi-selection many clips (has audio linked) after move clips will do split audio automatic..that is not correct, strange operation..
B- insert clip from bin in timeline 2.0 not work (2 times) see screen record , begin video..
i find ERROR: for "zone out" from [ALT+direction right], result ERROR because that zone out is added new frame.. maybe problem from playhead error position?..or error for ALT+DIRECT-RIGHT..? Added 3 clips to the timeline, with some overlapping, applied some effects (LUT, transform, etc. - just playing around really). The thumbnail and box that shows the video disappears. If I move the audio clip up or down a track then the video clip reappears. This does not affect the monitor output, only the timeline view. Compiled Kdenlive using instructions on Wiki with new xUbuntu VM. I found a Bug with the "Change Speed" function. If you save a project with a clip in the timeline, that uses speed changes and reopen it again the speed change will not be load correct. First the speed of the clip is changed correct, BUT the label doesn't show the value (as it did before reopening the file) and if you open the dialog by right clicking and choose "Change Speed" also this value is wrong (100%). clip on timeline -> change speed to 200% -> save project -> close and open Kdenliven -> load project -> change speed to 100% -> failed in audio tack.